An evening of sound and film performances with Paul Clipson, Collin McKelvey, Linda Scobie, John Davis and Josh Churchill. Paul Clipson is a San Francisco-based filmmaker who often collaborates with sound artists and musicians on live performances, films and installations. 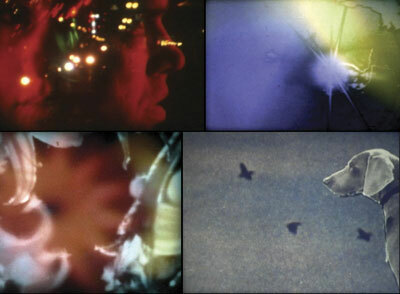 His Super 8mm films are shot and largely edited "in-camera", in an improvised manner that brings to light subconscious preoccupations in the hope of allowing for un-thought, unexpected visual elements to reveal themselves. Orbless is the solo sonic explorations of Oakland based multi-media artist Collin McKelvey. Utilizing an analog and digital modular synthesizer in conjunction with field recordings, processed found sounds and computer based synthesis, Orbless creates subtle interwoven textural pieces that slowly reveal themselves forming out of atmospheric buzzing. Linda Scobie is DIY filmmaker who works in 16mm. Her films have been shown in the Black Maria, Antimatter and Ann Arbor Film Festivals. Her latest piece "Sky Dogs" is a 20 minute paper animated voyage through the cosmos, with dogs. She currently works at Canyon Cinema; inspecting film and programming screenings. Joshua Churchill is a San Francisco based cross-disciplinary artist whose immersive site-specific sound and light work takes the form of both installation and performance, very often blurring the line between the two. Utilizing resonant frequency drones, field recordings, and processed acoustic and electric musical instrumentation and reactive lighting, Churchill explores the aesthetic, emotive, and structural qualities of the environments he works with and within to compel those that encounter it to become critically aware of their surroundings. Joshua Churchill often performs in collaboration with film and video makers, as well as part ofambient doom/drone trio Riqis, and has exhibited and performed extensively both locally and abroad.